This David Hunt Lighting Orb 5 light ceiling pendant in black matt finish features a 60cm globe with hanging candelabra inside. Handmade in Britain and finished to order with a hand applied finish using airbrush techniques to achieve a flawless look. A contemporary feature pendant that takes traditional style and manipulates it to produce a stunning modern alternative. 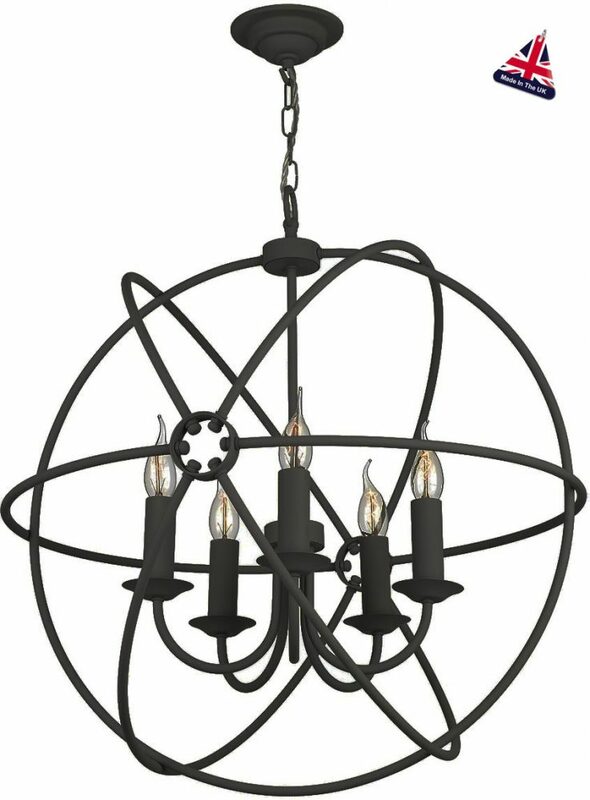 The flat black matt finish, open sphere and central chandelier combine to produce a centre-piece that will attract admiring glances and positive comments wherever it is installed. Supplied with an extra 50cm of cable so the chain can be extended upon request to provide a maximum drop of 175cm. There are matching fittings available in the black finish Orb lighting collection; please see below. Also available finished in antique copper, cream or ash grey. This contemporary light is designed and made in Britain by David Hunt Lighting who are well known for the design and manufacture of original hand crafted products such as the Orb 5 light ceiling pendant in black matt finish you see here.